Sorry to hear about the bad news...but the crepes look lovely...this is my first time visiting your blog and I'm enjoying my visit! I love that you're posting recession busting recipes! Keep up the good work! These look great. You have a great blog theme going, I like it! AH WORK CUTBACK AND PAY FREEZES...THEY ARE ALL OVER THE PLACE. Delicious! Ratatouille is so versatile. 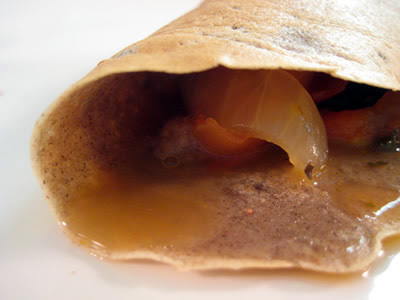 The buckwheat crepe idea is fantastic. So sorry to hear about the bad news. DH just got a job after being laid off this year (and starts on Monday) -- will hope everything turns around for you as well. In the meantime, try to enjoy. Yum. Ratatouille is a family recipe for me, my Grandmother was French. How great to combine it with a crepe. Great blog you have here. This is how we all should try to cook everyday. Delicious without breaking the bank. Adversity has the effect of eliciting talents, which in prosperous circumstances would have lain dormant. Horace. I like your blog, and your attitude. The recipe looks really yummy and healthy. Corsets? Maybe there is an upside to this recession thing. Crepes look amazing! Thank you for sending this recipe! Looks really good! Recently I just started posting recipes from my cooking group's members and instructors on a Japanese recipe site both in English and Japanese. I'm originally from Japan and have family there including my parents. The site below is similar to Allrecipes but it's Japan's No.1 recipe site with more than 500,000 recipes submitted by members. Interestingly enough, I just posted a ratatouille recipe from my member who's originally from Hungary, and being Hungarian she throws tasty Hungarian paprika into almost everything including ratatouille. She brought the dish to my potluck party and it was very good so I got the recipe and posted on the site. I was wondering if you would let me translate this recipe into Japanese and post it on my site..both your original English text and my Japanese translation? Of course I will introduce it as your recipe, and give the link to your site here... If you're OK with it, please let me know...The Japanese love crepes, and they also like buckwheat (buckwheat noodle is a traditional staple there) and they also like ratatouille (they even use Japanese vegetables and add soy sauce and other condiments to make it a la Japanaise! haha), so this recipe could be a hit! Those crepes look amazing. I will definitely give this recipe a try. So sorry to hear about the work woes. Hope things improve soon. These crepes sound delicious! I can imagine the great smells. 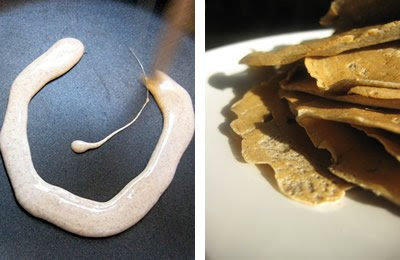 And buckwheat flour really is preferred for making savory crepes; it gives them a heartier flavor. I used it when I made crepes with chicken and mushrooms. I'm sorry to hear about your job, I work for myself and outsourcing cutbacks are bad too, but it sure does help to cook something wonderful doesn't it? I love crepes and your dish sure makes me think happy thoughts!! Your Ratatouille looks wonderful, will be trying this. I am so sorry to hear about your job situation and hope that you are able to find work vry soon. That looks great. Two french recipes combined into one. yum! Aaaaaaah! i love it, especially since i just finished watching the movie "Ratatouille", this is going in my recipe book! The ratatouille sounds great... I love vegetables and I am alway looking for ways to try something different with them. Will try it some time. That looks so good. Tx for posting it. haven't tried using buckwheat flour yet.. very interesting.. very healthy. Thank you very much for the permission to post it on my Japanese site, and voila! I just did it. When translating the instructions, I was really impressed with your personal style of writing recipes.. easy to read and thorough, and it coveys very warm feeling that you'd like to encourage people who might have never made crepes before. "Failure breeds success” is the universal truth! I tried my best to give the same nuance in Japanese translation. I introduced the recipe as yours and gave the link to your site. The site lets me know how many access I get to each recipe everyday and how many print-out made by readers as well as emails sent. Readers can also post their own cooking report on my page with their pictures when they try the recipe on their own. Such a great recipe! I'm so happy you've posted a straightforward crepe recipe and the ratatouille sounds delicious. We've stopped eating out but I swear that we're eating better (and I don't just mean 'more healthy') since I've started cooking at home. This is when you realize what restaurant mark-ups are really like! I am so sorry to hear about the work situation. That is super stressful and I admire that you are able to keep cooking and being creative in the midst of that! I love ratatouille but always want a starchy thing to go with it, so am excited to try this. These look amazing! 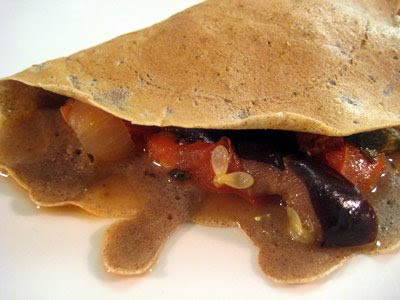 My husband and I have a can of ratatouille in the cupboard right now-- so we might just make the buckwheat crepes! I love your site----hope the job situation settles down a bit for you though and it's more of a loose corset! Wow they look really really good! Love the crepe that looks like it has a cheeky smily face on it while in the pan!